Dove Cameron and Mitchell Hope's love story in Descendants is part of what made that Disney Channel Original Movie an instant classic. Their characters Mal and Prince Ben have that whole star-crossed couples vibe to them just like all the great fictional love stories that have some before them. Think Romeo and Juliet but you know without the tragic ending. So we'll go with more Troy and Gabriella vibes, since it seemed like they too came from totally different worlds and everyone seemed to be surprised things would work out. But in Descendants 2 — which is gracing your television screens for the first time on July 21— we see that Mal is struggling with her life in Auradaon, especially when it comes to uploading the perfect princess-like image for her royal boyfriend. She's the daughter of one of the baddest villains ever after all! Living up to someone and what can feel like the world's expectations isn't easy, which leads Mal to make the rash decision of ditching her new life and heading back to the Isle of the Lost as she heads on a journey of even more self-discovery this time around, something Dove exclusively told us all about when we caught up with the actress. "Part of the magic of Descendants is that it’s taking a bunch of really relatable circumstances and putting them in a fantastical setting. And I think that’s what makes it so watchable, so digestible and that’s why fans love it so much and why we love it so much too. 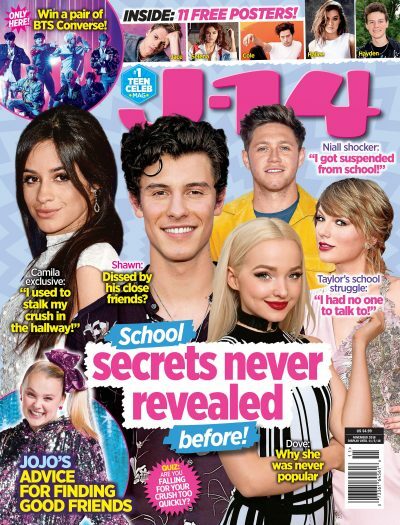 We learn so much through doing it," Dove said to J-14. "You’re absolutely right: [Mal] was attempting to be something for her mother [in the first movie], now she’s attempting to be something for her boyfriend. She is one of those people that puts on this really tough exterior to protect the fact that she’s really one of the most sensitive people in the world, which drives her intensity and her emotions. She felt like she had to put herself in a position of power because she didn't have any inside." Mal really has so. many. layers. But that's part of why she is such a beloved character and Dove was totally game when it came to really showing all of Mal's depth, which felt such a personal connection to. Dove simply just gets Mal. "So I feel like this time around, she kind of realizes that because in the first one, she had this personality that she had adapted to, that she’s had her whole life, that she shakes by the end of it," Dove said about Mal's arch in D2. "Now this [movie], she’s like 'I’m not that, so I’m going to swing hard in the other direction and be everything I wasn’t.' Then she realizes, when she has that big breakdown, like 'I can’t be that,' Dove explained. "And when she eventually runs away to the Isle, that’s her panicking, because she’s like, 'If I’m not that, and I’m not that' — in her brain, everything is black and white — 'I’m not that, I’m not that. What am I? I’m nothing. I should isolate myself from everyone.' Which is actually such an intense decision to make. She’s running away from everything and everyone she knows to go back to a place where everyone hates her and she has no family." Mal really does shock everyone with her choice to head back to the Isle, especially knowing that Uma is there you know, just waiting for Mal since they have a bit of a not-so-nice history together. Playing up this truly lost, broken and confused side to Mal was something Dove said she was looking forward to, since she got to really to tap into a story that literally anyone watching will be able to connect to. "I, as an actor, you know, you just read it as she ran away to the Isle, she ran away from home. But if you really think about that, that kind of intensity behind that decision, it’s really dark and heart-wrenching. That’s why I chose to play Mal as truly lost and almost transparent throughout the whole film, like there’s no personality to her, she’s just this walking-talking-mess until the last 20 minutes. So it was a really intense experience for me as an actor. It’s my story in a lot of ways. But it’s just a story of human development. We all kind of struggle for a long time until we accept that there is nothing to be except one’s self," Dove said to us. Now while there is definitely plenty of internal struggle Mal has with herself, there are some happy moments too and as Dove promises there is "so much more romance this time" between Mal and Ben. She is actually dating her other D2 co-star Thomas Doherty who plays Harry Hook in real life, but Dove explained that her bond with Ben himself, Mitchell Hope, is something she values so much. "Mitchell is one of my favorite people on the face of the Earth. I mean that in a real way. You know how people say that in Hollywood? I wouldn’t say that unless I meant it. He’s a really sensitive human being and so am I. So when two people recognize a commonality, it’s like looking across the room at someone the first day of school and it’s like I see me in you and you see you in me," Dove told us. OK now that is just the sweetest and it's clear they really are so close after all this time working together. She gushed even more about the pair's friendship and how he is someone who means the world to her, which overall helps them bring their characters' story to life together in such a believable way. "Mitchell and I were each others’ rocks in the first film. Then in the second film, we were inseparable. He’s like my best friend, my brother, best friend — which is why it’s so funny that we’re significant others in the film. But it creates this comfort-ability as actors where we get to really go there with each other," Dove said. "And I think that’s why there’s so much chemistry on screen, because I tell him everything! He’s like my best girlfriend, except he’s a guy. I spend every moment with him on set. It was really lovely to get to explore the relationship more because we both really care about our characters in a weird way that you don’t necessarily have to. Yeah, I laugh with him maybe more than anyone else, except for maybe Thomas who’s my real life boyfriend." This is just everything any Mal and Ben shipper could ever hope for so shout-out to Dove for making dreams come true out here. Knowing these two are actually so close literally makes watching this love story play out on-screen before you even sweeter.